In seconds, EverTrue gives you the power to narrow down your constituent base using criteria from your database and our integrations. Simply open up the “Filters” menu and apply one or more filters. Below you'll find descriptions for some of EverTrue's filtering options. (Note, not all filtering options are listed here). For a more comprehensive look at all of our currently available filters, head right into the platform! Additionally, some filters offer a help tip to the right of the filter after selection. Your Capacity Rating - This field reflects your organization’s constituent capacity score or rating based on your organization’s specific scoring process (if provided). Please contact your Customer Success Manager for further explanation of this field if it's unclear. Rated? - Does a constituent have a capacity rating? Lives in wealthy neighborhood? - Constituents whose address is in a census tract with a median home value greater than $1M. Neighborhood Medium Home Value - Medium home value of a constituent's home address neighborhood. Based on U.S. Census Bureau data. Neighborhood Medium Income - Medium income of a constituent's home address neighborhood. Based on U.S. Census Bureau data. Your Engagement Score - This field reflects your organization’s constituent engagement score or rating based on your organization’s specific scoring process (if provided). Please contact your Customer Success Manager for further explanation of this field if it's unclear. Engaged on Facebook? - Constituents who have liked or commented on any of your provided Facebook pages. Last Facebook Engagement Date - A data range filter to find the last time constituents have engaged with your (connected) Facebook pages' posts. Total Facebook Likes - Constituents who have "Liked" your connected Facebook pages a certain amount of times. Total Facebook Comments - Constituents who have commented on your connected Facebook pages a certain amount of times. Facebook Engagement Type - Constituents who have engaged with specific Facebook pages using Facebook Reactions (Like, Wow, Love, Haha, etc.). Facebook Page Engagement - Constituents who have engaged with specific Facebook pages already connected to EverTrue's Core Platform. Facebook Content Engagement - Constituents who have engaged with Facebook posts from pages already connected to EverTrue's Core Platform that contain specific keywords. Facebook Engagement Date - A data range filter to find constituents who have or have not engaged with your (connected) Facebook pages' posts during that time period. Donor? - Has a constituent given at least once, i.e. have a Lifetime Giving of greater than 0. Lifetime Recognition Credit - Calculated by adding all imported hard credits, soft credits, and outstanding pledge balances. 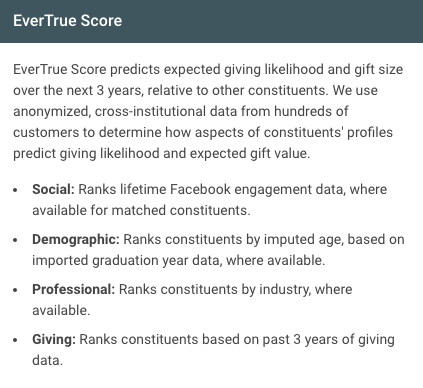 All data is based on imported transactional giving data and Gift Types as defined by EverTrue. *Only available to customers sending advanced transactional giving data. For more information, contact your Customer Success Manager. Pledge Balance - *Only available to customers sending a pledge balance field. For more information, contact your Customer Success Manager. 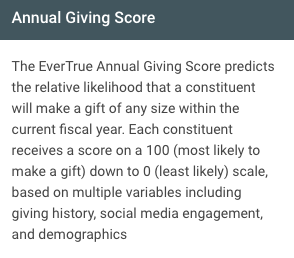 Note, if the EverTrue Score (see below for more information) has been enabled for your organization, the EverTrue Index will not be available. For more information, contact your Customer Success Manager. 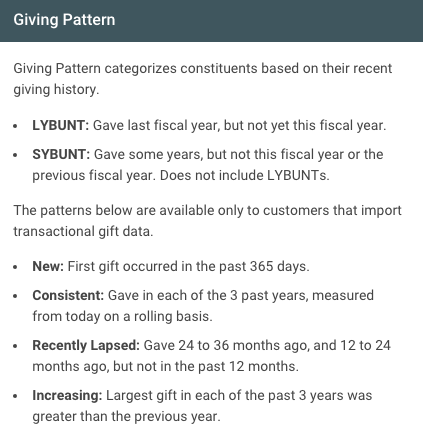 Gift Label, Amount, and Date - Based on individual gifts from a constituent, i.e. per transaction. *Only available to customers sending transactional giving data. For more information, contact your Customer Success Manager. Matched on LinkedIn? - Constituents who were successfully matched to LinkedIn using the email provided by your organization. Note, this score will only available if enabled for your organization For more information, contact your Customer Success Manager. If the EverTrue Score has been enabled for your organization, the EverTrue Index will not be available. 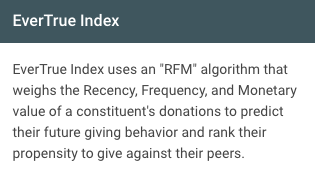 Donor Score -This field reflects your organization’s constituent donor score or rating based on your organization’s specific scoring process (if provided). Please contact your Customer Success Manager for further explanation of this field if it's unclear. Assigned To - The fundraiser, officer, or manager assigned to a constituent. Assigned? - Is a constituent assigned to someone? Solicitation Code - This field reflects your organization’s solicitation codes or information per constituent. Please contact your Customer Success Manager for further explanation of this field if it's unclear. Prospect Status - This field reflects your organization's prospect status per constituent. I.e. Where is a constituent in the funnel? What is their status in terms of management? Has Primary Email Address? - This field represent all constituents that have a designated primary email address. Graduation Year - A constituent’s primary class year (or other year) associated with your organization. Reunion Year Group - Filter constituents based on any reunion year group. E.g. 1's and 6's. Education Year - The year associated with a particular education history item, imported from your organization. This filter works best when combined with Education, Degree, or Major filters. LinkedIn Location - A constituent’s self-identified location from LinkedIn. Interaction Content - Search for keywords in each interaction. Interaction Date - A data range filter to find all interactions that occurred during that time period. Interaction Author - This field allows you to find the specific authors of each interaction. *Only available to customers sending interaction data. For more information, contact your Customer Success Manager. Did not give this Fiscal Year - Find all constituents who didn't make a gift during the current Fiscal Year. Online Gift: Date - A data range filter to find all gifts made through an online giving page during a certain time period. Online Gift: Amount - Find constituents who have made a gift through an online giving page above or below a certain amount. Online Gift: Is Recurring? - Find all constituents that have set up recurring gifts through an online giving page. Online Gift: Page - Find which constituents donated through each specific online giving page. Online Gift: Designation - Find which constituents made designations while making a gift through an online giving page. Online Gift: Comments - Find which constituents made comments while making a gift through an online giving page. **Only available to EverTrue for Annual Giving customers. For more information, contact your Customer Success Manager. Constituency - Filter on whether a constituent is an alumni, parent, board member, etc. Any custom fields implemented by your organization will be listed here and available as a filter.